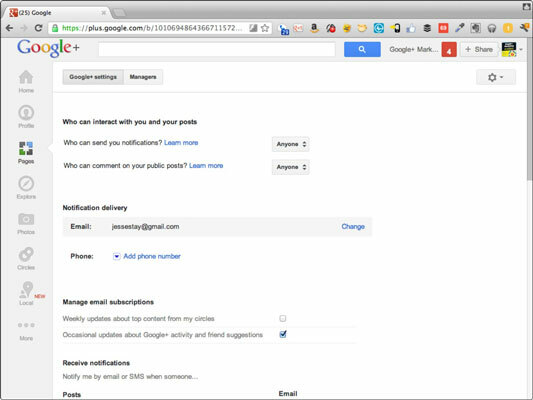 Go to your Google+ Page in administration mode (click the Home icon after you have logged in as your Google+ Page). Click the gear icon in the upper right of your news feed. Follow these same steps when you’re logged in via your profile and adjust very similar settings. The audience that can send you notifications: You can get notifications from anyone, from anyone in your circles, just from circles, or from individuals. The audience that can comment on your public posts: If you want to be careful of spammers and trolls, fine-tuning this setting can help. The default, which is how you should leave it, is set to Anyone. But you might experiment with reducing the audience to smaller groups of people, depending on your strategy. For example, limiting comments to your page’s circles gives a feeling of exclusivity to those who participate in your page’s posts. Users just can’t see each other’s comments until you circle them first. The e-mail address (and/or phone number) where new notifications (comments, mentions, and so on) go for your page: This address or number is where Google+ will send new notifications if you opt to receive them by e-mail. If you specify a phone number here, you’ll receive notifications by text message. What types of e-mail subscriptions you want to receive from Google: Google can send basic newsletters to let you know what’s happening on Google or in your circles on Google+. Read through the list and see whether anything interests you. Someone adds your page to a circle. Someone interacts with your photos or photos in which your page has been tagged. How you want Google+ to manage photos as you upload them for your page: Here you configure options such as whether Google+ will adds geographical location to your photos or tries automatically to detect people. Enable privacy settings to determine who can see when your page is tagged by other people: Go through the list, and think carefully about how you want to configure this and for what audience you want to configure it. If you think your page could get tagged in an embarrassing photo, consider that possibility when you’re choosing this setting.